Our Milky Way galaxy isn’t alone in this corner of space—it’s orbited by a few smaller dwarf galaxies, including the Large Magellanic Cloud. Inside that cloud is 30 Doradus (or the Tarantula Nebula), a “starburst” where stars are formed at a much higher rate than the surrounding area. And 30 Doradus has too many massive stars. Scientists use a mathematical equation called the stellar initial mass function to determine how different mass stars are distributed in a given starry place. A lot of thought goes into whether star masses are generally distributed the same way regardless of where you are in the universe, or if the amount of heavy stars can vary based on the local environment. Scientists have thought that areas with more star formation, like 30 Doradus, might have a higher percentage of heavy stars—but haven’t been able to check for sure. An international team of researchers have now taken new measurements of 800 stars in 30 Doradus, and they published the results in a new paper published in Science. They used an experiment called the “Fibre Large Array Multi Element Spectrograph” on the Very Large Telescope in Chile to observe these stars’ light spectra, or the colors of light they give off. They could robustly ascertain 452 of these single stars’ temperatures, rotational velocities, surface gravity, and brightness. And yeah, they learned some stuff. Of those 452 stars, 247 of them weighed over 15 times the mass of our own sun. And they found 32 percent more stars above 30 solar masses and 73 percent more stars above 60 solar masses than well-accepted models of stellar mass distribution predict. They found evidence of stars bigger than a previously suggested maximum stellar birth mass of 150 solar masses. There’s still a lot of uncertainty in the data, the authors admit—which leaves the question of just how weird 30 Doradus is. 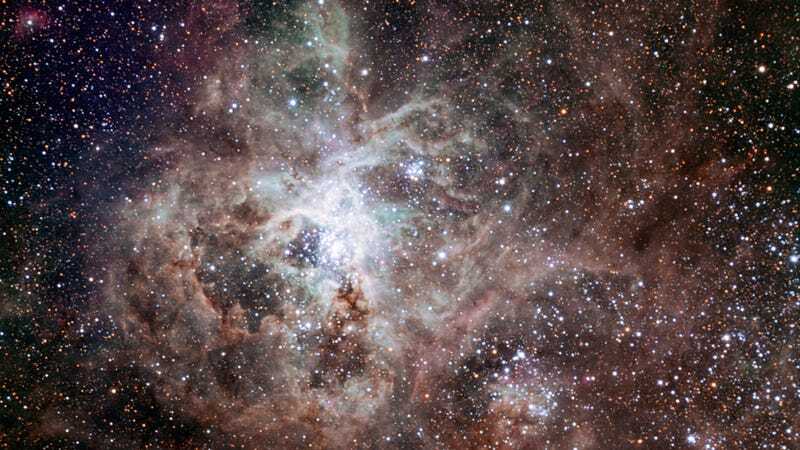 “If there were more areas like 30 Doradus in the early universe, then the early universe could have contained many more big stars like this than our canonical model says,” Mark Krumholz at Australian National University in Canberra told New Scientist. That would have other implications: more heavy stars in the universe could mean more black holes and more supernovae, which would lead to a higher rate of black hole collisions and gravitational waves as well as more heavier metals in the universe, for example. So yeah, it looks like the universe could be stocked with some pretty hefty balls of gas.